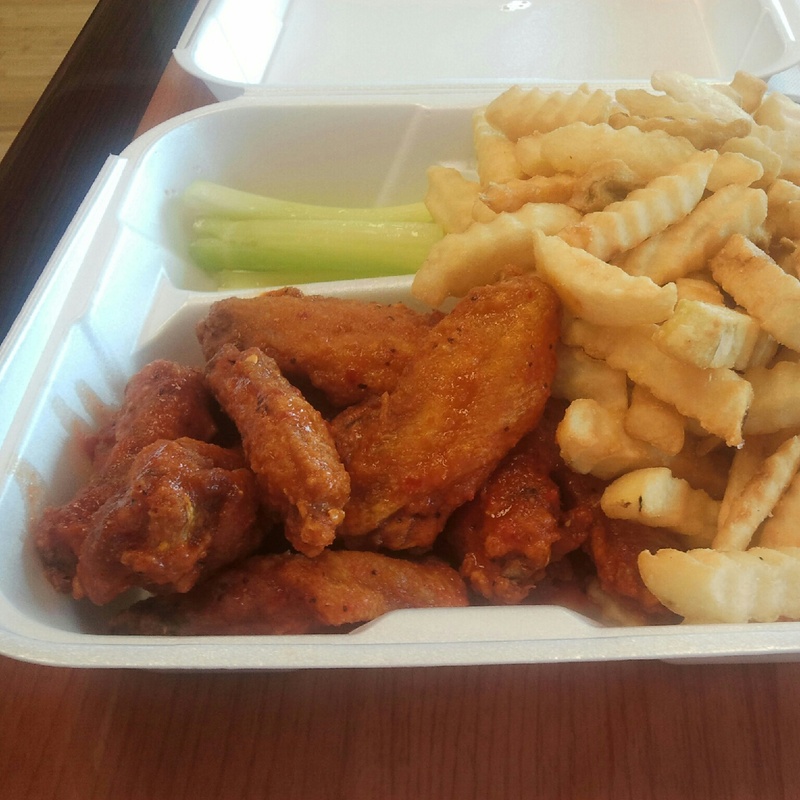 It’s a tiny wings joint near Club Drive and Pleasant Hill, and it has a unique (I’d say very good) wings sauce. The sauce has more in common with a finely ground salsa than the tomato soup consistency of a vinegar based wings sauce. For that reason, I’d suggest trying it out. You can see black and red pepper specks in their wings sauce. It’s Asian run, if not Asian owned. I’d guess Korean owners. The iconography is cute, the inside is clean and neat, the tables are nice, and I hope this place makes it. The finely ground nature of the sauce comes though in the specks of pepper you can see on your wings (both black and red). They’re not afraid of spice here, something that leaves me smiling big time. 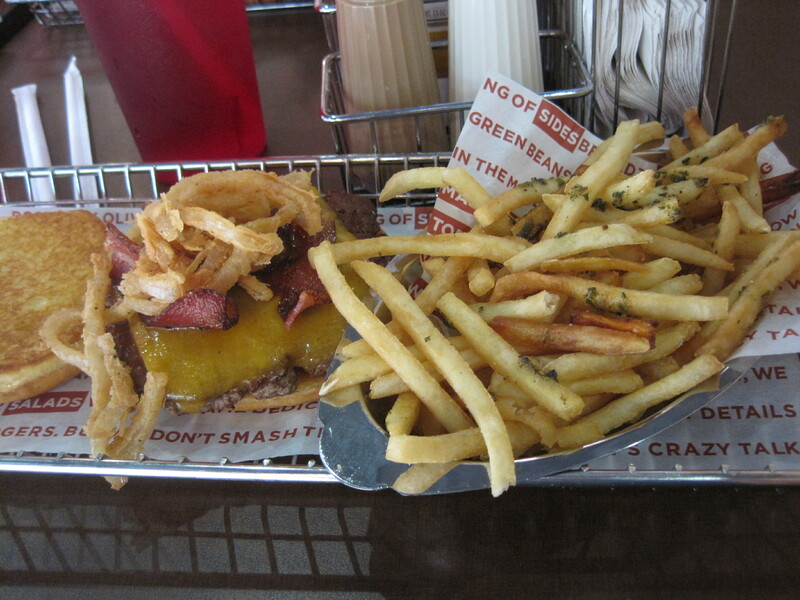 Eating food at the Johns Creek Smashburger is a kind of Russian Roulette. You pay your money and you take your chances. I saw plenty of happy people there on the day we arrived, a store dealing with a restaurant perhaps 70 to 80% full. If, on the other hand, they manage to mess up your order, you end up in a kind of living hell, because this restaurant currently lacks the people skills to overcome multiple staff mistakes. That’s a little unfortunate, as the menu is dynamic and versatile and very diabetic friendly. That versatility is one reason that we went back to Smashburger as my wife spied it on the way home. Further, glowing reviews, such as the one Grant Goggans gave here, led me to believe this place was a step above most fast food fare and comparable to a poor man’s Farm Burger. No, unfortunately, what we experienced is a version of the classic bad fast food experience, with all the problems and mistakes one comes to expect of bad fast food restaurants. I’ll simply quote what I recently posted on Urbanspoon. The manager of this restaurant took the order and he messed it up in multiple ways. The food in the ticket delivered to his staff was not the food delivered to our table. When my wife went to ask for the things that were forgotten, she was asked to stand in line once again, a rather long one. 20 minutes after she made her second order, my daughter asked, “Isn’t the guy who was standing behind you now eating?” 10 minutes after that, my wife went up to ask what happened to her order, and they ignored her one more time. At that point we left. This was the worst customer experience I’ve suffered in the ATL since I began food blogging over 3 years ago. If McDonald’s is your standard for burgers then this place is an upgrade for you …slightly though. at this point I can only agree. The lack of skill at this location is telling. Caesar salad. Tomatoes struck me as a little odd, but they’re listed as part of the online menu. The mixture of greens is also off putting. IMO, they should simplify this salad to classic caesar ingredients. Tastes fine, though. Spicy Baja burger and veggie fries. The veggie fries were a little oily, but the kind of thing that could make this chain useful to diabetics. Certainly, it’s a superior side to the classic french fry. The burger was decent, not really impressive. My daughter’s BBQ burger and fries. We found the sauce too sweet. And for want of some fries, our patronage was lost. The burgers weren’t the highlights of our meal. My wife regarded her chicken as good. My daughter had a disagreement with the sauce on her barbecue burger, but otherwise the ingredients weren’t bad. The best thing about the meal were the oversized $4.99 salads, which had plenty of greens and were served in enormous bowls. The fries – my daughter actually received hers – had a mixed reception. She didn’t like them much, I thought they were a fine enough version of the thin fry. 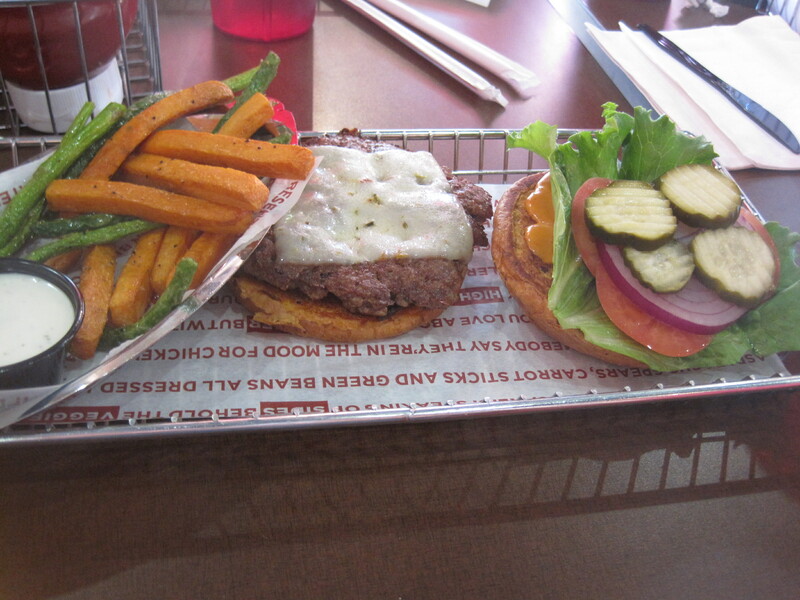 i had my first smashburger experience when i visited charlotte, nc for the weekend – and either i was STARVING, or it really was one of the best burgers i’d ever had. 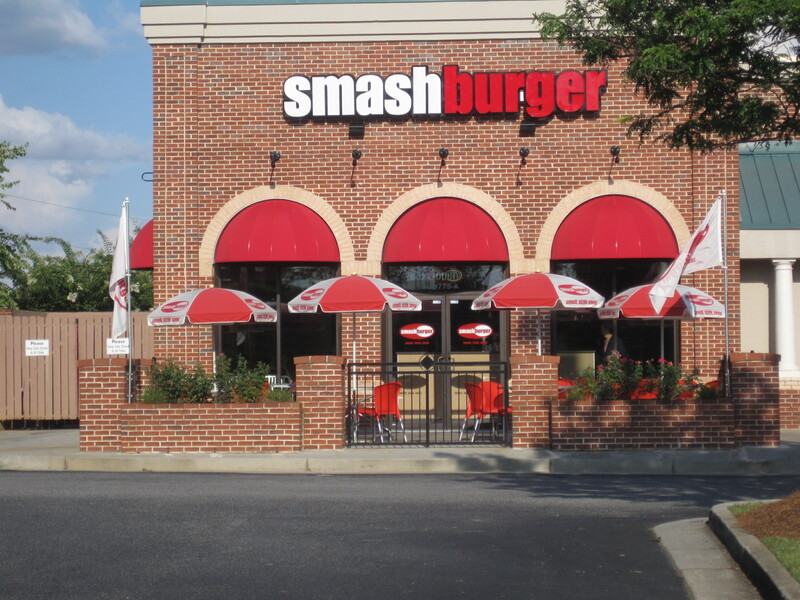 upon hearing that smashburger was opening up in johns creek, i got really excited!…until i actually ate here. i came here with a friend for dinner one evening, the first thing i noticed when i came in was that the restaurant was FREEZING. it was very uncomfortable to even sit inside, so luckily there was patio seating outside. when we went up to the counter to order, we were greeted by a very unenthusiastic cashier who didn’t really know the menu (or the cash register) that well, and ordering our food took a very long time. i created my own burger, and the portion was extremely small and not very filling. i ordered the regular fries, which were bland, limp, and cold. my friend ordered the smashfries, which supposedly had rosemary, olive oil, and garlic – but just tasted exactly like my regular fries, with a few sprigs of rosemary tossed on the top. disappointing. but like all hopeful foodies, i came back here once more with another friend, hoping that i just had one bad experience, and that smashburger wasn’t really that bad. nope. probably won’t be coming back here again. In short, I don’t think the chain is a bust, but I do believe this location is a misheard order away from becoming a food disaster. Staff are well meaning I believe, but incompetent when it comes to service. How much do fries cost Smashburger? Ten cents of potato, perhaps? How big a loss would it have been to have just comped my wife’s fries when they were found to be missing? The notion that you can do these kinds of things and please customers is exactly what’s missing at this Smashburger. If I may be allowed an entirely politically incorrect notion, I’ll note that this store is just across the road from a Tilted Kilt. This class of restaurant, including the better known Hooters, are places where service is everything. Without waitresses that can serve and charm, there is no business model for these eateries. So, in a fantasy world where I would be king for a day, I’d fire the entire staff of this Smashburger and replace the manager with a Tilted Kilt bartender. Whether that person could run the restaurant, I do not know, but that person would have forgotten more about customer service than this staff currently displays. I have entirely biased feelings towards the chain “Sonic”. 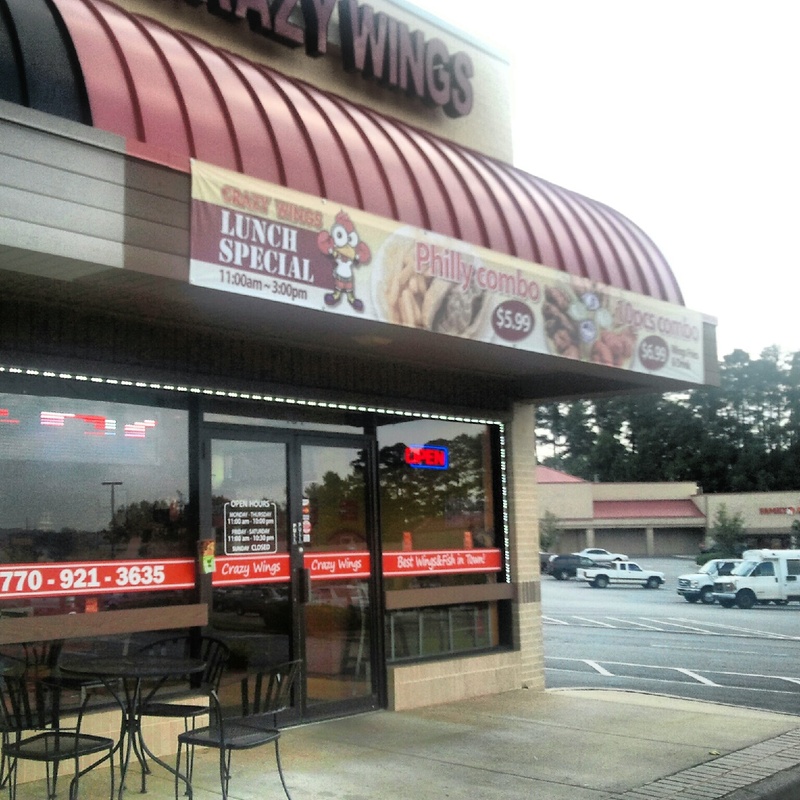 When I first arrived in the Atlanta area, I was staying in a weekly hotel on Cobb Parkway, about half way between the Marietta Diner and the Big Chicken. The closest restaurant to that hotel was a Sonic, and especially on days when I had little if any money, I was living on Sonic Jalapeno Double Cheeseburgers, onion rings, and a large fruit slush. These days I live near Snellville, and the closest Sonic to my house is the one on 820 Oak Road, near the corner of Oak and Dogwood, just across the street from Danthai. A number of my daughter’s friends have worked at this one, on and off, and it tends to gather a teen aged crowd in the afternoons. 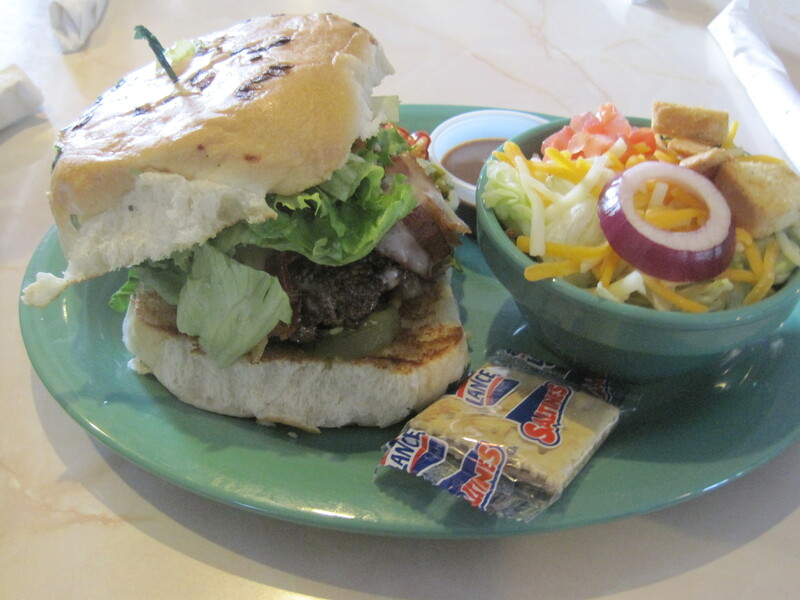 These days, the Jalapeno Double Cheeseburger, as a menu item, is long gone. 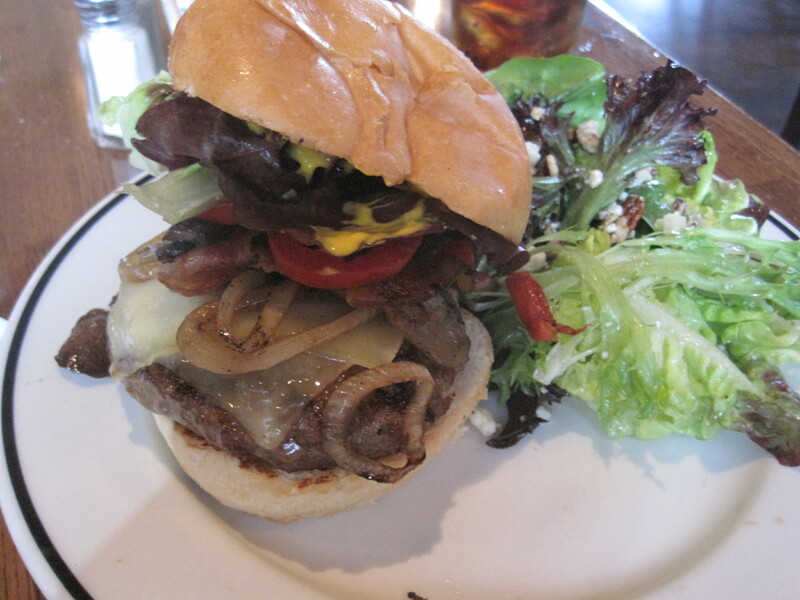 You can approximate it, though, by ordering a Double Cheeseburger, add japalenos. 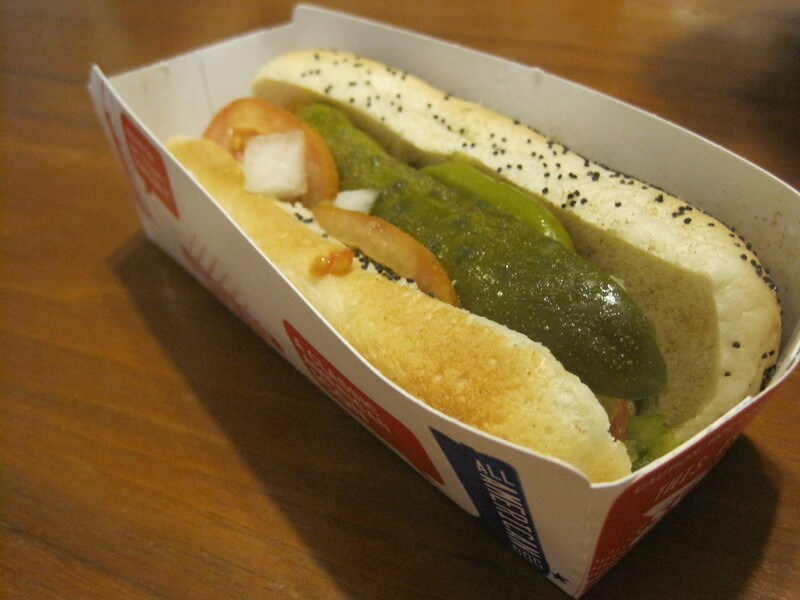 Among other things, Sonic is serving a Chicago Dog these days. 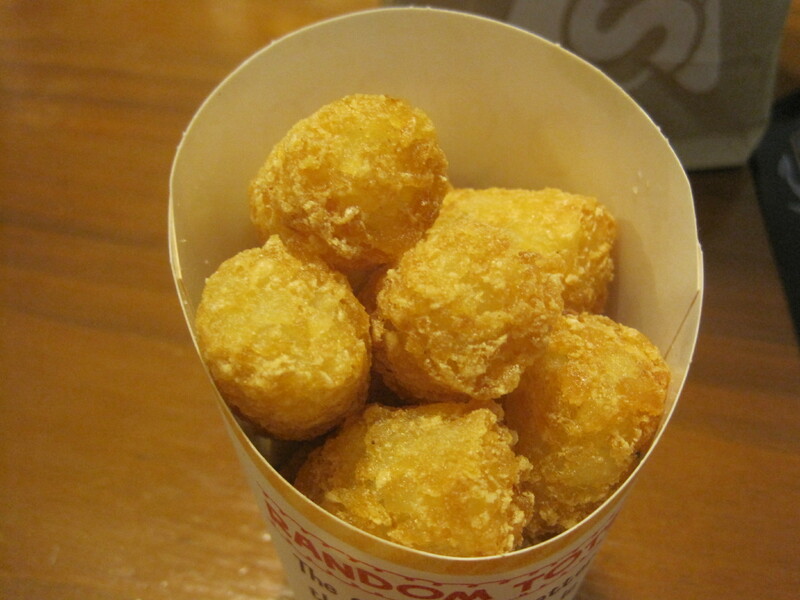 Tater tots, one of a variety of sides offered. 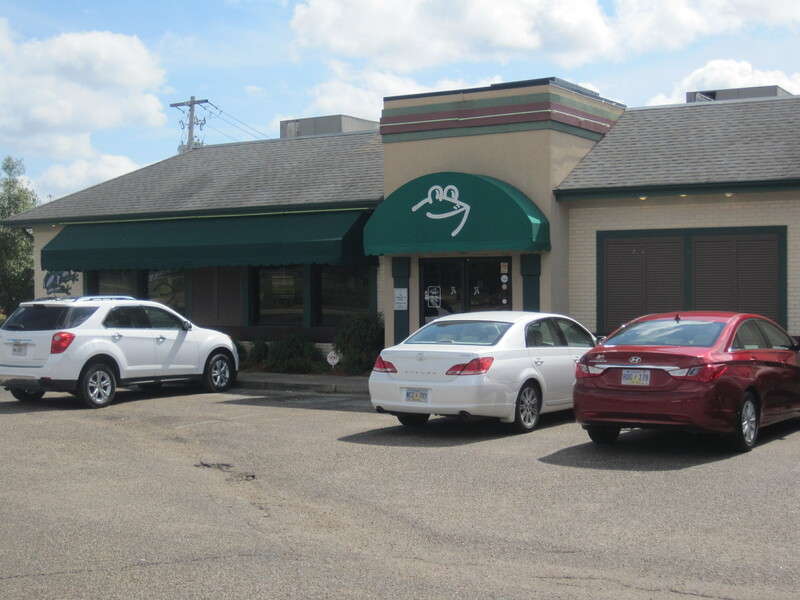 It’s the rich variety of options that sets this restaurant apart. You have all kinds of side items, a crazy-quilt selection of drinks. It has a way of making customers feel like kids all over again. 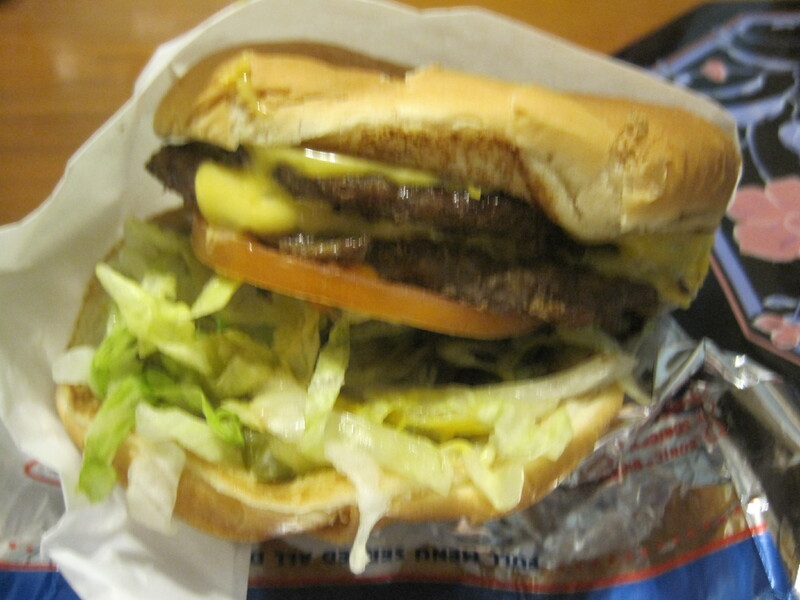 Double Cheeseburger, add jalapenos. It’s been my Sonic staple for over 17 years. Some food reviewers from Snellville have tried to make comparisons between 5 Guys and Sonic, as in, which one is better. To me, that’s an apples and oranges comparison. A typical 5 Guys is a small restaurant, compact. A 5 Guys restaurant would live well in a crowded urban downtown, and the menu is focused on doing just a few things well. Sonic, by contrast, is selling a past that never existed – seriously, these burgers are just too big to be 1950s and 1960s authentic – and doing so in expansive fashion, with a big menu. I could imagine sneaking a 5 Guys franchise into San Francisco, but I can’t see it being done easily with Sonic. Not surprisingly, when we get relatives in from San Francisco, they like going to Sonic, with the caveat that to a San Franciscan, nothing ever beats an In and Out Burger. But to summarize, Sonic is good greasy fun. It has large burgers with decent options, plenty of sides, and over the top drinks that make this a kid pleasing place to park a family. Local Republic was a chef’s recommendation, a bar, and on Urbanspoon, it’s classed as a gastropub. On a bright spring day, I was able to head up Highway 29 and into Lawrenceville and try it out recently. 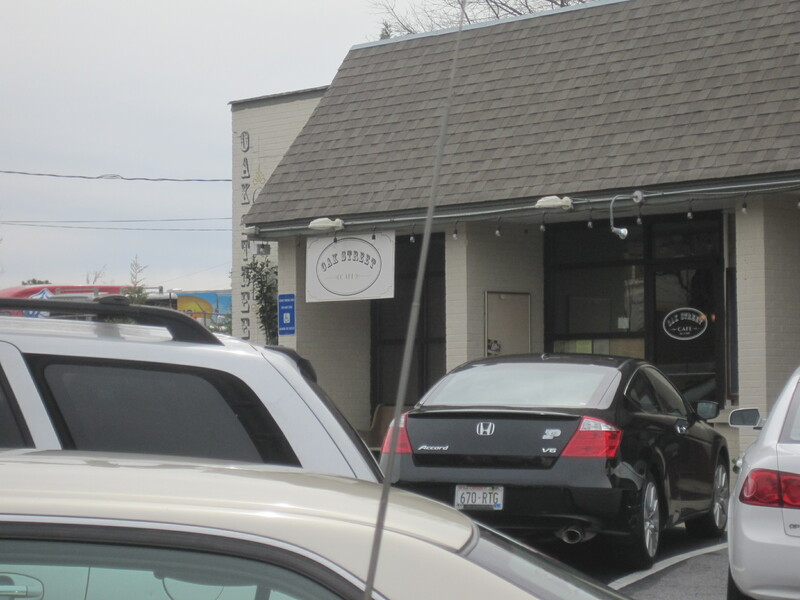 To note, ‘gastropub’ is a moniker that is controversial in this town, because of Meridith Ford Goldman’s negative use of the term in her review of Salt Factory Pub (named Red Salt at the time). And of course this represents a problem, because her review really never bothered to say what a gastropub was. So what is a gastropub? If only a name chef is required, then HD1 is a gastropub. If only great food is required, then Ria’s Bluebird is a gastropub. And since no one has bothered to tell Meridith Ford that an absence can’t define, we’re more or less left with a critical status quo that has Holeman and Finch as a gastropub, perhaps Leon’s Full Service as well (but maybe Leon’s is just too 2010 to count anymore), and that Red Salt isn’t (because, of course, burgers disqualify you as a gastropub, unless you’re Holeman and Finch and only sell them when vampires are afoot). What is clear is that Local Republic is an ambitious eatery for its place and location, that serving escargot in a bar is not typical fare, and that putting a nice little proto-gastro-eatery right across the street from McCray’s is also quite gutsy. 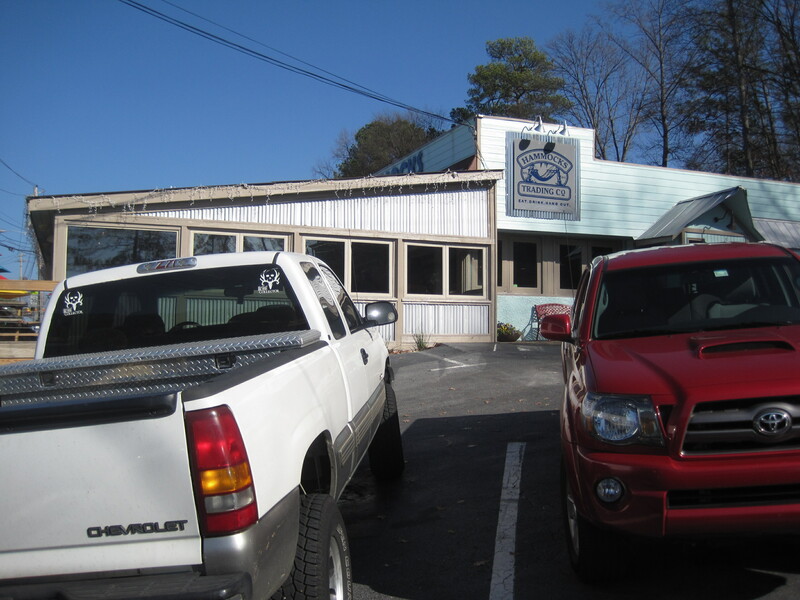 The owner isn’t afraid to take risks; witness his excellent looking Johnny’s in Grayson. The location is cute, has its own parking (important for an eatery close to the square in Lawrenceville), and some good outdoor seating. In terms of beer selection, Local Republic has ten craft beers on tap. The selection varies, and they don’t print a beer list. On a blackboard, they keep a list handy. 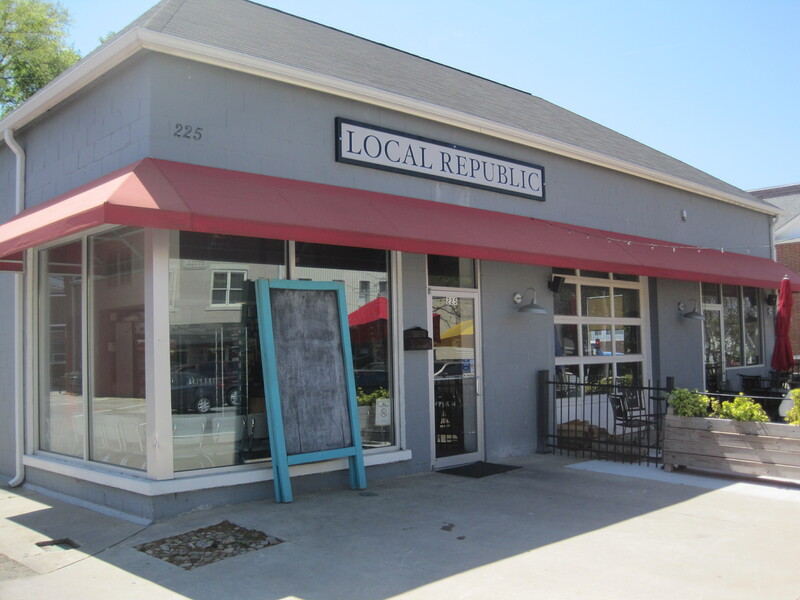 So, the question: is Local Republic a gastropub? Let’s talk about the food we had and get back to that. Local Republic has some very attractive small plates, and that’s what we focused on. Yes, the signature dish here is supposed to be shrimp and grits, but that’s dinner fare and we had been nibbling before lunch began. 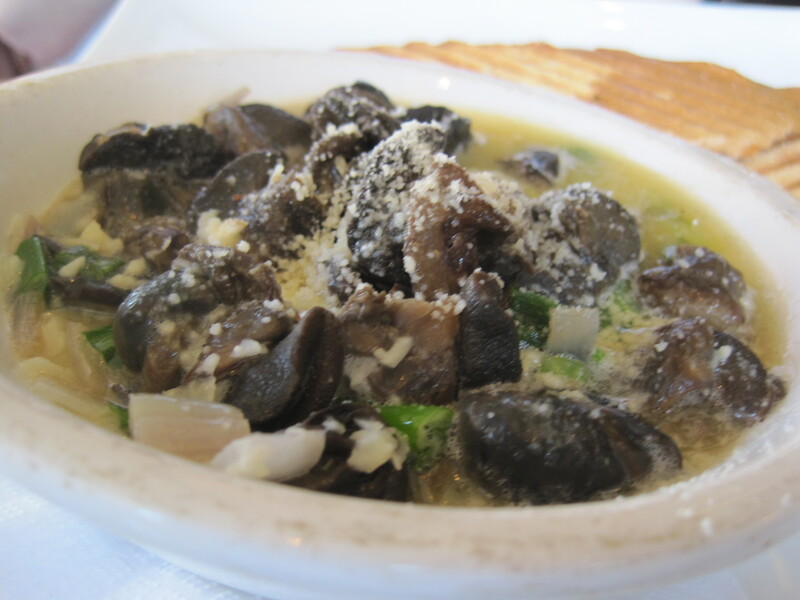 My daughter had their escargot. That was the most successful dish of the night. She liked it, and my sample was flavorful, buttery, earthy at times. Escargot. 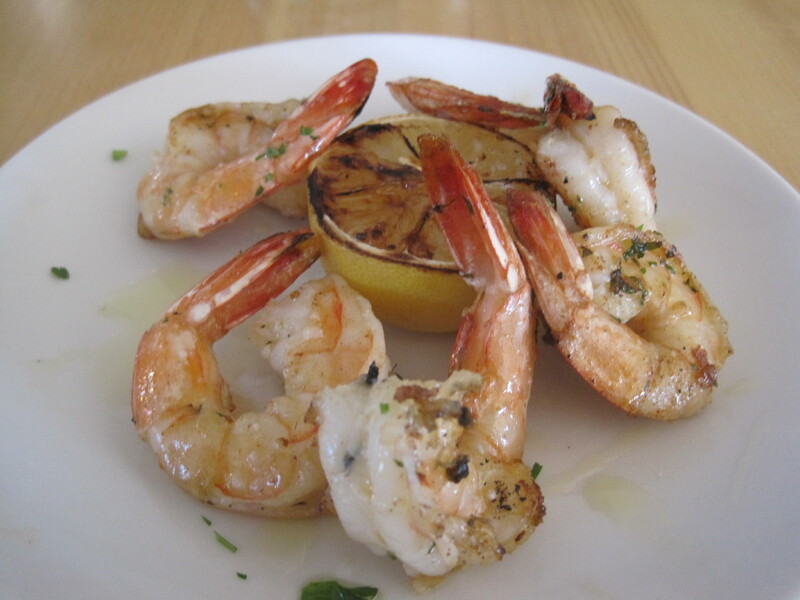 Our favorite dish when we ate. 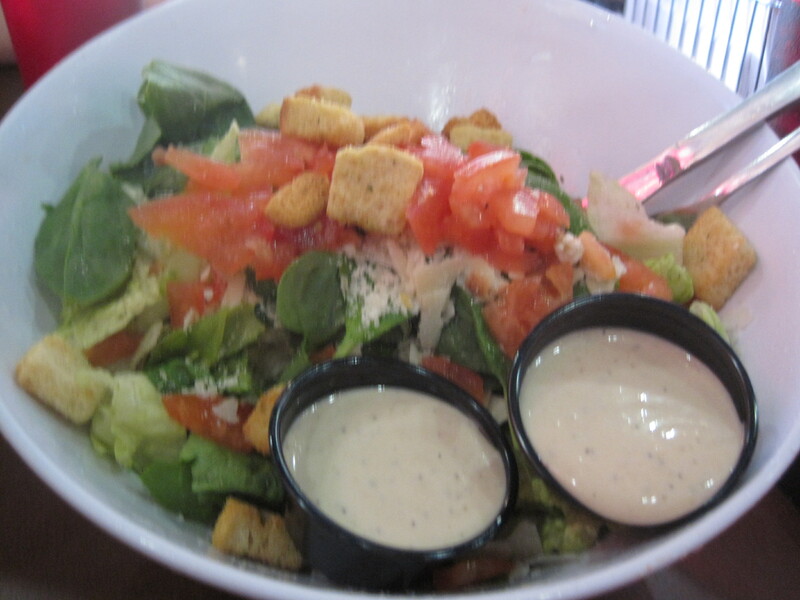 The salad was a delight, tender leafy greens, but not in any sense ambitious. 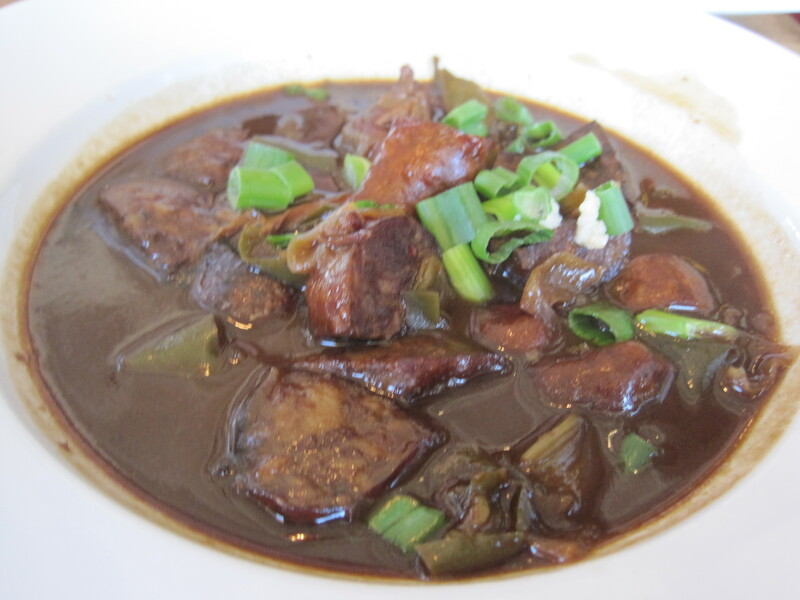 The gumbo was something of a quandry. Yes, it was good tasting, smoky, some complexity in the broth, but really didn’t “hit the mark” as a gumbo, and there was no spice, or heat, to speak of. 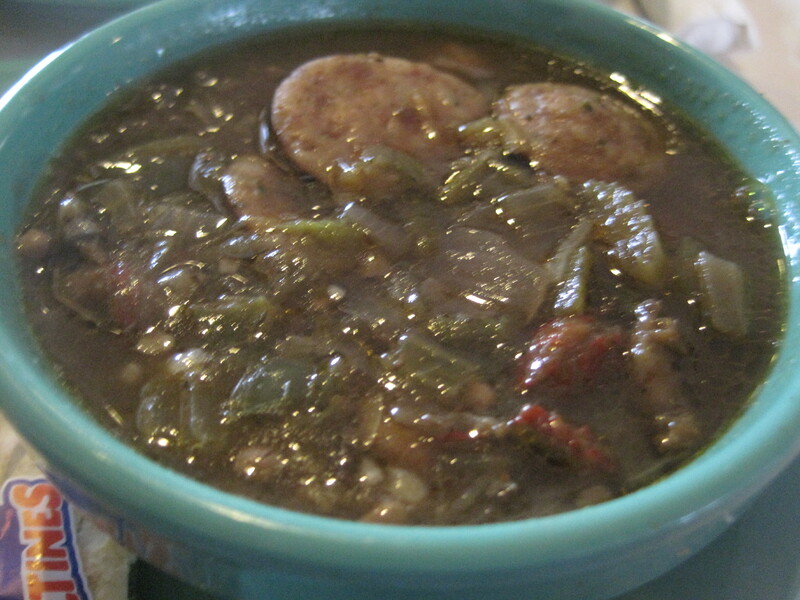 I’d had a good gumbo recently at the Froghead Bar and Grill in Mississippi, with on point flavor and spicing. Local Republic’s fare isn’t anything like the gumbos I grew up on in Lousiana. Nevertheless, it was interesting. 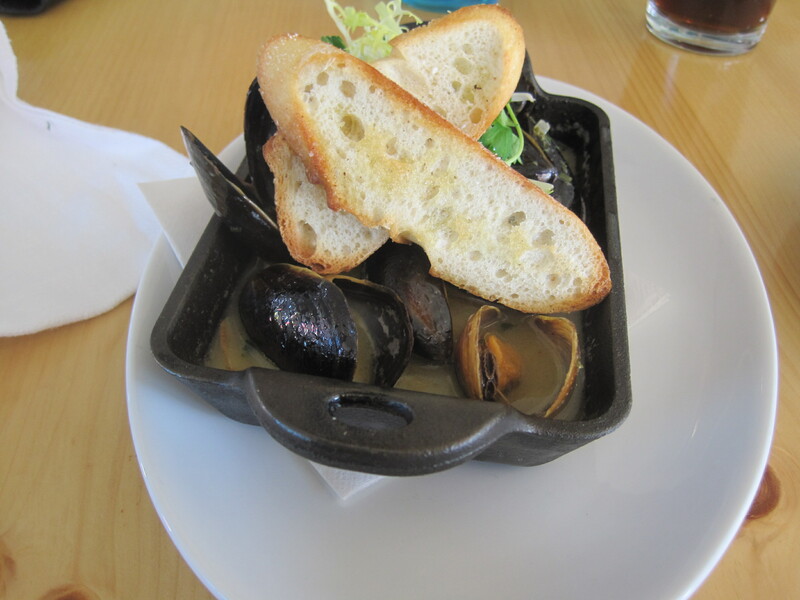 The mussels were an enormous serving, and the size of the serving presented a problem. 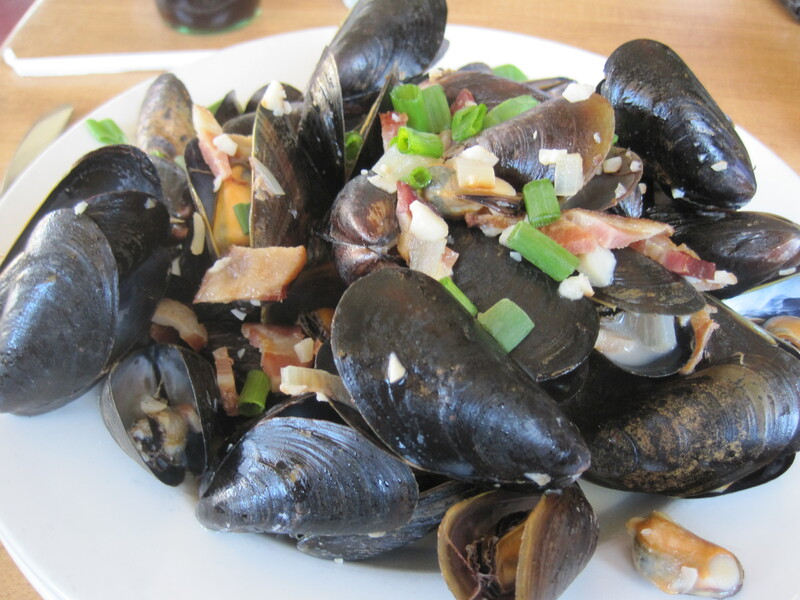 The mussels were better when dipped in the broth that came with the seafood (milky, with bits of garlic in it), but there were so many mussels, you really needed 3 bowls, one for the mussels, one for the shells, and a third for the broth. Dry, the mussels weren’t as delicious as they were when dipped. So, is it a gastropub? Personally, there weren’t enough “wow” moments to class this eatery in the same strata as H&F or Leon’s. A more appropriate comparison would be Salt Factory Pub. That said, any eatery with this level of ambition and execution automatically becomes a factor on the northeast side. Any foodie from Tucker to Suwanee to Lithonia would be well served by the trek to Lawrenceville Square to try this eatery out.